Do you need a vacation? Well, come load up your family of four, your camping gear, and head out to a quiet campground for the weekend with this Flying Cloud 20FB! 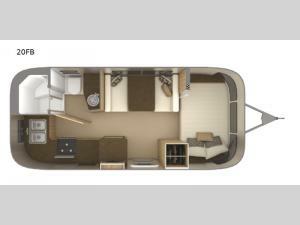 Inside this model you will find a unique rear kitchen with conveniences that allow you prepare your favorite meals! Enjoy eating with your family at the dinette and in the evening when you are ready to turn in for the night there is a front bed plus the dinette can convert into a sleeping area.